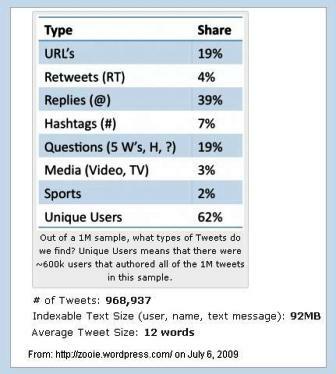 Hats off to fellow WordPress blogger who has published a thoroughly scientific analysis of the categories of tweets. As the communications geek, it provides a great quality check for micro-bloggers large and small, at any phase of their social networking journey. It’s interesting to surmise how a new micro-blogger may do more in the way of sending replies to other posts, and retweeting other’s articles as a way to establish presence. It’s also interesting to see that replies (39%) make up the largest category following “Unique users.” As a non-scientific cultural observer, this reaffirms micr0-blogging’s strength — and Twitter’s greatest asset — is in building compact, highly engaged communities.